Pasta is the ultimate comfort food for people in the West. If your kids are bored of roti-dal-sabzi-rice kind of food, try bringing in some veriety by adding lasagna to your menu. One good thing about lasagna is that once you have prepared the baking tray, you can just sit and relax - catch your favorite TV show or read a book! Another good thing is that the recipes are usually very fluid. You can add your own ideas and replace some ingredients with the ones you think will work for your family. It is also a good way of encouraging your children to eat vegetables. It is also a great dish to make if you are trying to finish up bits of vegetables etc in your fridge. 1. Start by making your Enchilada sauce, which is nothing but a tomato-coriader chutney in our language! Make sure to add garlic, onion and spices to your sauce before blending. 2. Prepare the hot filling for your lasagna by chopping vegetables of your choice. Bell peppers, zucchini, olives, carrot etc are all good choices. Saute chopped garlic and onion in a pan. Add chopped vegetables to the pan and saute for 3-4 minutes. Before you begin assembling your lasagne, set the oven to preheat to 180 degrees C.
Grab a casserole dish that is oven safe and begin assembly. You can buy corn tortillas or lasagna sheets to assemble in your dish. 1. Start by buttering your dish. 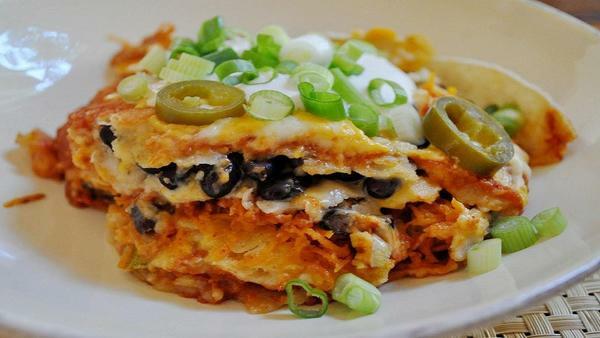 Smear a little enchilada sauce on the bottom and place a tortilla or lasagna sheet in the dish. 2. Top it with a layer of hot vegetable filling. Pour some beans on top. Pour some corn kernels on top. 3. Drizzle the enchilada sauce generously on top. Cover with a layer of grated cheese. 4. Cover with another lasagna sheet/tortilla and repeat steps 2 and 3. 5. Make 3-4 such stacks of layered lasagna sheet-vegetable filling-bens-corn-sauce-and cheese. 6. Cover with a generously layer of cheese and bake for 25 minutes or till you see the cheese bubbling away in golden delight! Try This Kung Pao Tofu Recipe Tonight! Tortillas Your Kids Will Love! Hot Manchow Soup for the Winters! How To Include Vegetables In Your Children's Diet? Make Vegetable Lasagna at Home!